March is officially National Read-Aloud Month, but you can take the Read-Aloud Challenge any month! You help children grow up knowing that books are their Super Power when you read aloud together every day. Research supports the many benefits of reading aloud to young children, however less then half of children under age 4 are read to daily in the U.S. It’s time to start a read-aloud revolution! Why are books a Super Power? When children listen to books read aloud, they learn about people, places, and how things work. They learn about emotions and feelings and how to use words to share their ideas. While enjoying the special connection of shared book reading, children naturally increase their vocabularies and gain the knowledge and skills necessary for later reading. Books teach facts, inspire imagination, and start children on a lifetime of learning. Parents and teachers can connect children with the power of books by reading aloud every day! Have success in school and in life! Explore the the tabs below for downloads and links to give you ideas and activities for making read-aloud a fun and exciting part of your classroom or home. 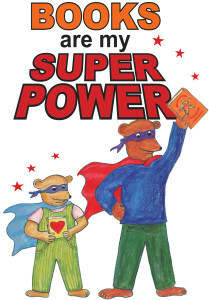 All you need to make Books your Super Power! Super Hero Activity Page Print out, decorate, cut out, and use to dress up as a Super Hero who loves books! Kids Pledge Activity Print out, color, and fold and make it into your own book! Kids: Ask for read-aloud every day! Grown-Ups: Read to a child every day! Book Lists with Activities explore 5 Super Powers found in children’s books with related activities for your classroom. RAC Poster can be used at school to tell families about the Read-Aloud Challenge. Reading Chain Write down each book you read at home or school and make a paper chain. Watch it grow! Bag Tag Use this as a class project and show everyone you are proud to be part of the Read-Aloud Challenge. Poetry Play gives ideas for playing with words. Send home to families to motivate them to read poetry with children. 10 Great Reasons to Read Aloud to Children with Kids’ Activity. Read-Aloud, the Evidence: Learn the facts that support the importance and power of reading aloud to young children. Order the bilingual (English/Spanish) edition of the Family Reading Partnership book “At Home with Books/En casa con libros” at the deep discount of $4.50 per book (in quantities of 25 or more) to encourage more read-aloud at home. 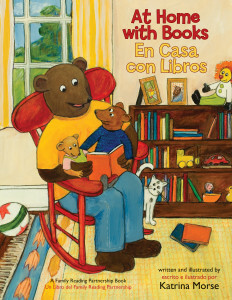 This is the story of the Bear Family/ la Familia de los Osos, who read books together all day with family and friends. Even Patches the cat listens in! The delightful illustrations are colorful and engaging. This is a story for children, but has subtle messages for parents about how and why to read aloud. A wonderful tool for family engagement, this story encourages a love of read-aloud and books. 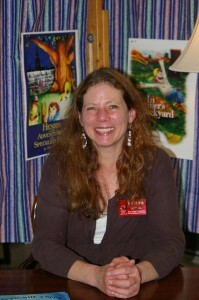 Read-aloud tips are included in the back of the book. You can order using Family Reading Partnership’s online cart. 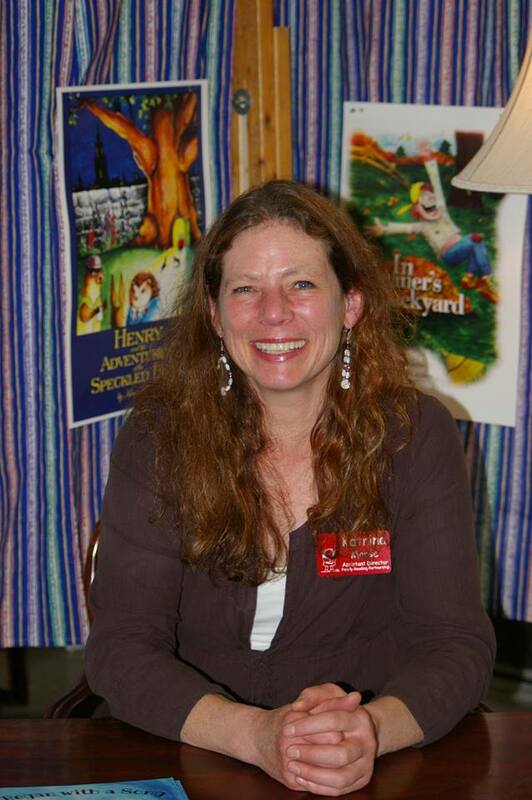 Hear “At Home with Books” read aloud by the author/illustrator, Katrina Morse! A Katrina Morse le gusta pintar, crear explorar, bailar y jugar con su gato. Vive en Ithaca, Nueva York donde la belleza y diversidad de las personas y el mundo natural inspiran su imaginación. Family Reading Partnership is a national leader in community literacy efforts, promoting and supporting family, school, and community engagement around children’s books and working to create a culture of literacy locally, regionally, and across the country. “At Home with Books/En Casa con Libros” is one of many Family Reading Partnership initiatives designed to deepen and strengthen the connection children and families have with books- building not only the foundation for reading, but the foundation for a good life. Family Reading Partnership es una organización líder a nivel nacional en esfuerzos comunitarios de alfabetización que promueve y ayuda a familias, escuelas y comunidades involucradas en la promoción de libros de niños y que trabaja para crear una cultura de alfabetismo a nivel local, regional y nacional. “At Home with Books/En Casa con Libros” es una de las muchas iniciativas del Family Reading Partnership – diseñada para profundizar y reforzar la conexión que tienen los niños y familias con libros – creando no solo una fundación para la lectura, si no también para una buena vida.